On Tuesday, The Korea Times reported that “Samsung Electronics will sue Apple over its release of the iPhone 5 for infringing on its fourth-generation (4G) long-term evolution (LTE) connectivity patents, according to industry sources.” In light of the recent US federal court decision holding Samsung liable for infringing a number of Apple patents related to mobile device features, usability, and design, Samsung may now be flexing its patent muscle in an area where Apple may fall short on innovation: 4G connectivity. Envision IP analyzed Samsung and Apple’s US patent portfolios to determine how many patents each company owns related to 4G (3GPP LTE) and its underlying and predecessor technologies, such as UMTS, GSM, and EDGE. 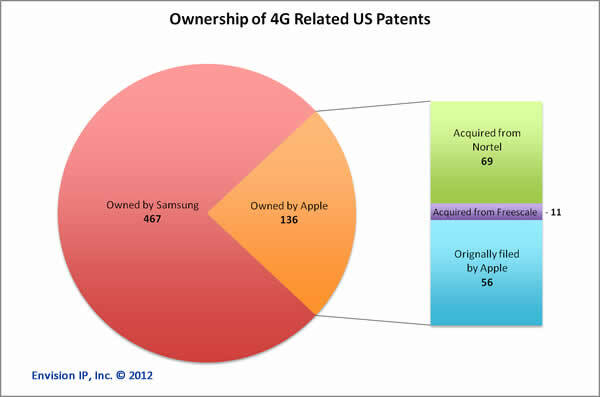 Samsung owns 467 US patents related to 4G and its underlying technologies, while Apple owns 136 US patents relating to the same. Interestingly, of these 136 US patents owned by Apple, 69 were obtained from the Nortel Networks patent acquisition by the Rockstar Bidco consortium of which Apple was a member. Another 11 were acquired in a May 2011 purchase of patents from Freescale Semiconductor. Looking at the filing trends for these patents, Samsung began filing patent applications for mobile connectivity related technologies that underlie 4G in 2003. Apple itself did not begin filing similar patent applications until 2006. It is important to note, however, that these patents Apple acquired from Nortel Networks were filed as early as 2000. Our analysis suggests that Samsung has invested significantly to develop proprietary 4G-related technologies, while mobile networking technology has not traditionally been a focal point of Apple’s R&D efforts. Apple began filing patent applications in this area in 2006, three years after Samsung; indicating that Samsung has at least that many years of R&D investment in 4G-related technology over Apple. It is also clear that Apple, in obtaining the Nortel Networks and Freescale Semiconductor patents, has been shoring up its IP in 4G technologies, recognizing the importance these patents will play in the near future. Whether Apple’s acquisition was defensive or offensive remains to be seen – and in the meantime, Samsung will try its best to settle the patent score.